Financial Standard - Search - "Jo-Anne Bloch"
No results found for "Jo-Anne Bloch". If Labor wins the upcoming Federal Election, don't expect the new Treasurer to go easy on underperforming funds - industry or otherwise. The Board of Taxation has commenced a review into the tax implications of granny flat arrangements. A $2.5 billion Melbourne-based boutique has hired a new portfolio manager from a family office as it builds out its global capability. Industry Super Holdings is under pressure to divest its stake in a company that supplies weapons technology to Saudi Arabia from the global community. Keep up to date, don't be the last to know! Get the Financial Standard Daily Newsletter. Experience a smart, simple and seamless online platform for quotes, applications, renewals, client management, scenario planning & advice tools. This new alternatives solution is designed to offer a smoother ride for investors, with three global managers in one Australian fund. Pocket investment guides featuring adviser case studies and a glossary. Investing trends and strategies from the industry’s thought leaders. Putting the spotlight on investment products that matter. Is the end coming for the sophisticated investor? How often do you access the financial advice provided by your superannuation fund? I am unsure if my super fund provides this service. Since launching in 2010, continuous innovation has been the hallmark of Mason Stevens' value proposition. Managing director, adviser services Thomas Bignill tells Karren Vergara how it's played out. (inc GST) for 1 year. The Australian Journal of Financial Planning. The Journal of Superannuation Management. The Journal of Family Office Investment. The Journal for Managed Account Professionals. 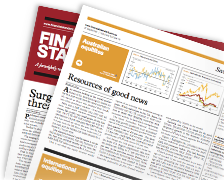 Download the Financial Standard iPad app for FREE. All material on this site is subject to copyright. All rights reserved. No part of this material may be reproduced, translated, transmitted, framed or stored in a retrieval system for public or private use without the written permission of the publisher.